My son loves bees. He asked for a bee party for his third birthday and is always trying to get the honey bees in our yard to land on his hand. So when I saw this project from Sugar Aunts, I knew K would love something similar. 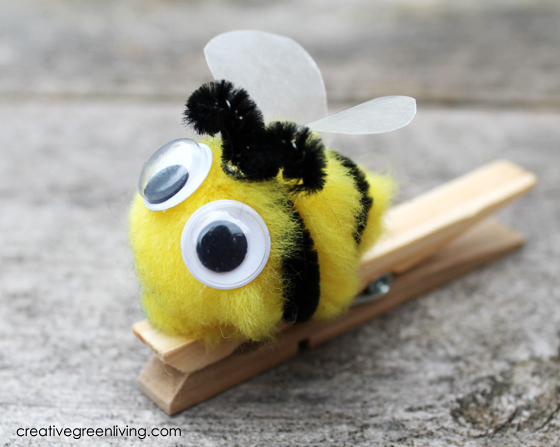 My bees are a little different that Sugar Aunts' - mine are on the pinching end of the clothespins instead of the gripping end. I also made a big fat queen bee. 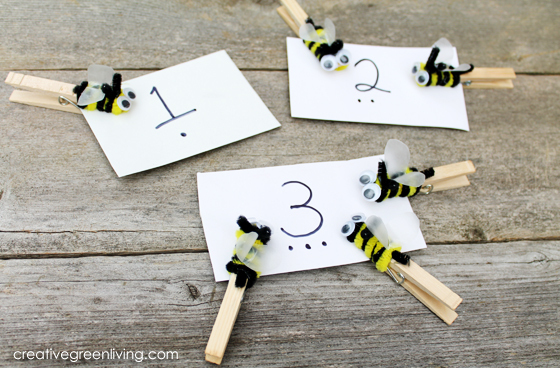 Go check out Sugar Aunts' post for more fun activities you can do with these bees! Get a black chenille stem and wrap it around the large yellow pom-pom. Add googley eyes and small pieces of chenile stem to be antenna and a stinger if desired. Add wax paper wings as for worker bees. Glue to top of a clothespin. These don't need to be fancy. I just got an old giftbox out of our recycling bin and cut it up it to make the flash cards using a permanent marker. I numbered cards 1-10. I also added dots under each number to correspond to how many items the number represented. There are a few ways to play with these bees and cards. 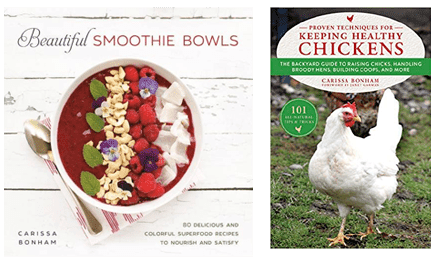 Here are some things we did with them. If you have more ideas for learning games to play with these, please leave a note in the comments! 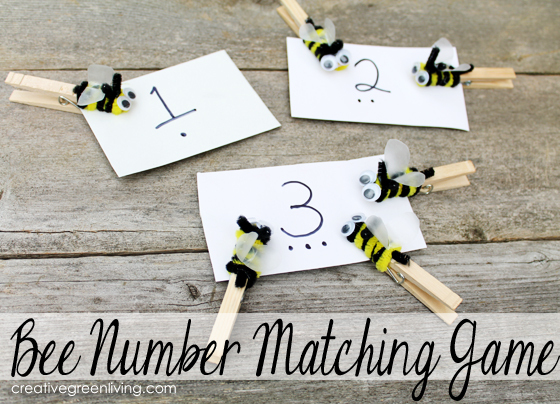 Go through the flash cards in numerical order together, helping your child name the numbers if needed. 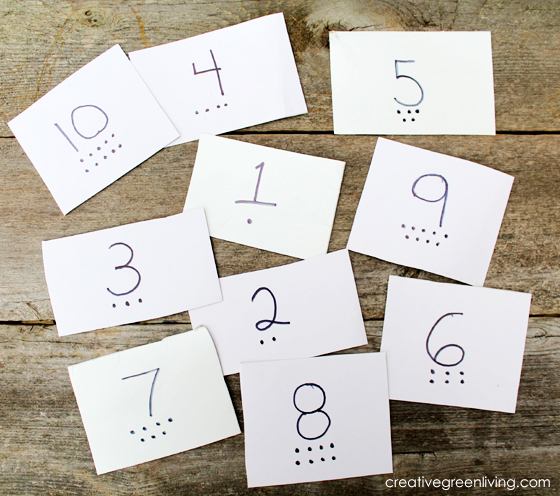 If they get stuck recognizing a number, help them count the dots under the number to discover its name. Go through the flashcards in random order. Help them as needed to name the numbers. 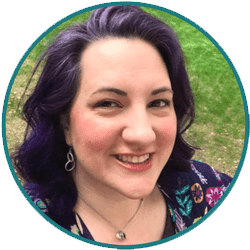 Help them utilize the counting dots underneath to discover the number's name. 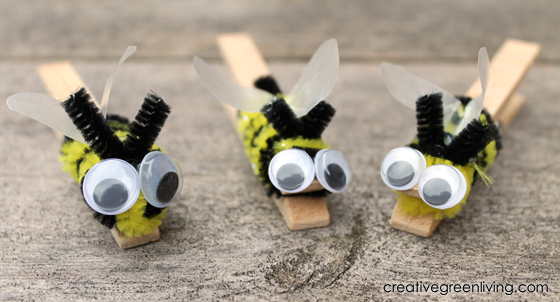 Use the bees like puppets to talk about what bees do. How do they pollinate flowers? Communicate with each other? Gather nectar? 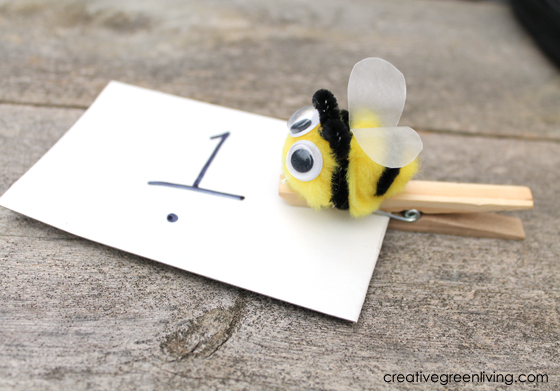 Clip bees on number cards to correspond to number on card (clip 2 bees to the number 2 card). Do bee math. Set out cards in a math equation (you may need to make additional equation marks cards)...2+3=5 for example. Clip 2 bees to the 2 card, 3 bees to the three card. Move all the bees to the 5 card and count them together.